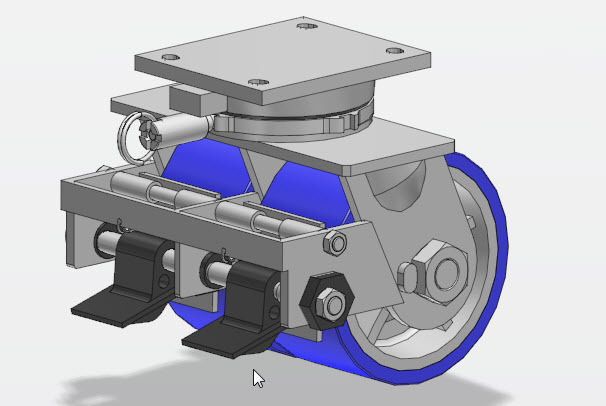 Whether you have recreated the Mars rover or are simply trying to make a giant dishwasher mobile at work, heavy duty casters are wheels that will attach to your equipment and support several different weights. Although there are ins and outs to using pneumatic and no-flat types of casters, in general, they are both reliable options for those companies that need to move a lot of weight. One of the top reasons that people choose pneumatic casters is that they can generally hold a lot more weight that a no-flat tire. In most cases, they can hold as much as 10 times the weight. They are also more flexible in that the owner of the caster can choose to use different tire sizes and tread. No-flat tires are convenient, because they will not go flat and compromise production due to a tilted platform like pneumatic wheels will. They are also useful because they have a uniform shape and size that lends itself to your cart or equipment moving exactly as you intended it to. If your equipment is parked in a flat area and weighs quite a bit, it is rare to see brakes that are built into the casters. Instead, you normally see a shim or a block used to keep the equipment in place. On the other hand, when you rely on small wheels that are food service or technology factory cart size, it is common to see casters with brakes built onto them. So when you design your next project, consider whether brakes make sense for the amount of weight that you expect to have on your factory, office, or warehouse equipment. When you move your equipment around, it cannot turn well when it is rigid, or the wheels do not swivel. If you have a lot of weight on your equipment, this can get to be annoying because you have to force the equipment to turn corners using brute strength. Wheels that swivel will solve that particular problem. They are wheels that are designed to rotate around when you are moving equipment in a way that would require the equipment to turn in order to get where you are taking it.